A Middle River man, facing a financial shortfall that blocked his plans for a charitable mission to Kenya, discovered a miraculous last-minute funding source – a Maryland Lottery scratch-off. The so-called “Missionary Man” won $50,000 playing a 50X the Cash instant ticket. After five months of planning, the prospect for his mission to rebuild flood-damaged villages in Kenya was beginning to look bleak. The 37-year-old had already spent a fair amount of money and energy preparing for the trip and travel expenses continued to climb. With just weeks to go, he was uncertain whether he could afford the trip. 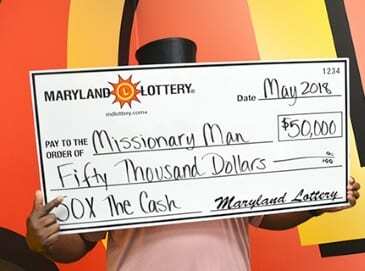 “Missionary Man” decided to take a chance on the Maryland Lottery. He purchased a pair of $10 50X the Cash scratch-offs at a Royal Farms store in White Marsh and played them while fueling his pickup outside the store. The first instant ticket won $20 and he began to scratch the second. Then, his miracle happened. “Missionary Man” revealed a 50X symbol, meaning he won the $1,000 prize beneath the symbol 50 times over. The lucky winner was still fueling his truck, with a small grin spreading over his face. After letting out a small scream of celebration, he began to call family members and his pastor to share the unbelievable news. “A way has been provided,” he said. “Missionary Man” said his mission to Kenya was back on track. The winner, a former U.S. Army staff sergeant and veteran of several deployments, is now parenting full time. He and his wife are excited about the win and the upcoming mission. “This trip is a way for me to help and give back to a group of people that have so much less than we enjoy in the United States,” he said. “Missionary Man” found his lucky win at the Royal Farms located at 11905 Market Way in White Marsh. The 50X the Cash scratch-off, which is part of the Multiplier Family of Games, still features three top prizes of $100,000, three $50,000 prizes and thousands of others ranging from $10 to $10,000. Other members of the Multiplier Family are the 5X the Cash game, 10X the Cash, and 20X the Cash games.